"I could not stand up for myself without a casual threat of a police call." I was three weeks away from leaving the city that grew me, as my time in New York winded down—when my racist roommate decided to try me. Her profile is the perfect example of how nuanced and palatable racism and misogynoir has become. She briefly attended NYU Wagner School (mission: to improve lives and make a difference) and spouts random unwarranted comments with her yt friends about how horrible police violence against the black community is. Yet, the moment I stood up to her obsessive terror, she threatened to call the police on me. With no hesitation, she leaned into her yt female privilege with the same ease as the last scene in the movie, Get Out. A brief wave of fear and anger overcame me, reminding me how little value my black life had in the face of a cunning yt woman who has the state, history and yt-ness to support her in all of her immorality. Throughout my time in our apartment, she innately fetishized my black girl aesthetic: hair, clothes, shoes, nails, lips, body, vernacular, music, everything. She’s made odd comments declaring her hate for white Americans, and states that as a Russian, she feels more comfortable with black people. She believed Clinton would save us, loves Bill Maher, black men and is the quintessential representation of yt female liberalism: dangerous. Her entitlement to control my actions and my refusal to let her led her to claim she hated my existence (even though I knew she meant blackness). I could not stand up for myself without a casual threat of a police call, therefore, I did a direct action. I use direct actions as a tool to publicly protest against various targets that violate basic human rights. Direct actions, also known as civil resistance, are a means to show that certain actions and policies are intolerable and thwart the progression of a modern society. Therefore, I felt it fitting to narrow the scope to the day-to-day racism that black people endure by letting the community know of my experience, and make them aware that their neighbor will demonstrate anti-blackness when she deems it necessary to restore social order. The construct of yt-ness allows yt people to feel an undeserved level of entitlement. In this specific case, my roommate demanded that I clean after our yt male roommates and their friends. When I rightfully refused, she began to scream and make vile micro aggressive comments exposing a perverse power dynamic in her head, such as, “You’re the only one with the balls to talk back to me,” “You are an angry ghetto black woman,” and to an extreme, “I hate your existence!” (She called me a Queen four weeks prior y’all). To oblivious eyes, this may simply seem like an over-analyzed roommate altercation, but what many fail to realize is that our bodies carry history. Our identities are constantly working for, or in my case, against us, as we navigate the world. A yt woman has no business demanding that I clean after other people and call me a “dirty pig” when I say no. As yt people move into historic black neighborhoods, they are forcing community members out of the city, thus causing our nation to experience modern colonialism instead of a natural migration. Yts are investing in property and land they never saw fit for investment in prior years. Zone lines are changing, bike lanes are being added and businesses that once served its neighborhood demographic are closing down. Yt people are now reengaging with the remaining pre-gentrification community members more than the initial redlining allowed. This reengagement in the midst of the brewing social climate is exposing the complexities of anti-blackness, and people must start fighting back and standing up for their right to peace and respect in the spaces they occupy. 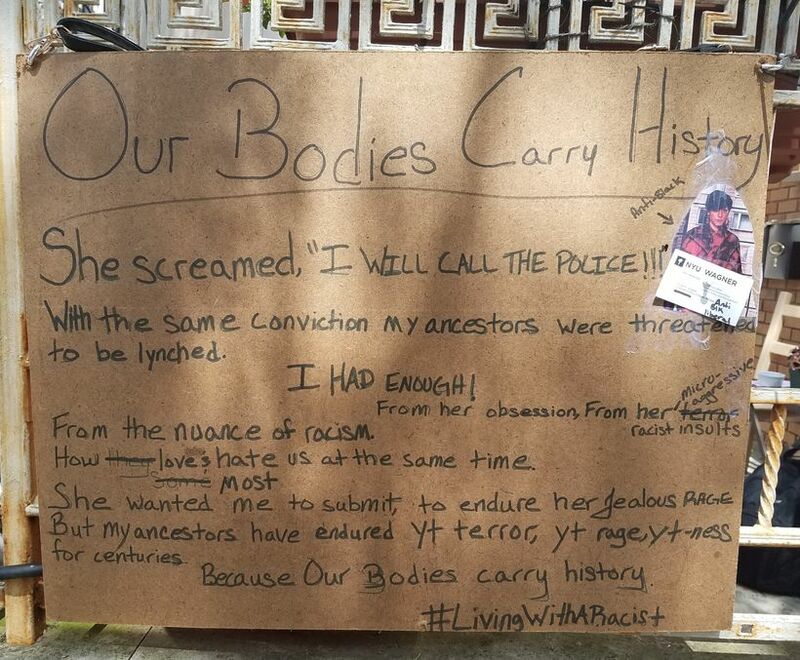 I wrote a short prose outlining my experience entitled, “Our Bodies Carry History” and hung it up outside of our apartment. I did a direct action in the form of a prose and hung it outside of the apartment. I spent my last two years in New York extending my labor to the movement for black lives, organizing with Black Youth Project 100 (BYP100). From artistic community engagement, to a nationwide action against the Patrolman Benevolent Association (PBA), to confronting predatory policing by NYPD on black and brown folk at subways stations, I have directly faced the machine of institutionalized racism. Although activists fight against systems of oppression, we have grown tolerant of interpersonal experiences of racism. Anti-black encounters are not isolated one-off incidents. Instead, these are patterns in a long line of cruel, inhumane and demoralizing treatments of black bodies that black folks have learned to cope with. It is time for our political to truly become personal by directly combating anti-black treatment in our workplace, stores, neighborhoods, and in my case, homes. In the turbulent age of the Trump Administration, we see how policies and state sanctioned violence is used to deny human beings equitable access to: healthcare, housing, education, jobs, living wages, media representation, clean water and more. These are things black people have always been denied. However, even when policies improve, our social interactions will remain archaic unless we simultaneously challenge those social contracts. That is why I did a direct action against my racist roommate, because the nearly 400 years (1619–2019) of racial terror against black bodies is completely unendurable in 2017. Our nation cannot progress without a shift in belief systems, and if that means calling out anti-black speech, actions and practices in our daily lives to hold yt and anti-black people of color accountable through direct actions, then that is the small and gratifying price to pay for our right to live a terror free life. And it is gratifying! Revolutionary meets yogi. She has lead workshops on intersectional identities in Black Queer spaces along with training LGBTQ homeless youth workers in understanding power and privilege. As life would have it, her interpersonal experiences and intimate struggles in the Movement for Black Lives has lead her to create a project exploring the need for emotional justice thus her creation, The SelfCare After Series: social justice infused wellness.